This page deals with the use of antibiotics in the treatment of prostatitis caused by bacteria, but not by nanobacteria, chlamydia, ureaplasma, gonococcus, tuberculosis, fungus, viruses and other infectious agents. The prostate is commonly colonized by bacteria and viruses. In most cases, such colonizing agents are not associated with specific symptoms. In other words, the identification and culture of infectious agents in the prostate does not mean that a patient has prostatitis. The pain and associated symptoms of prostatitis may be caused by infectious agents, including bacteria. However, because prostate pain is not specific to infectious causes such as bacteria, there exists the possibility that antibiotics targeting specific bacteria will not relieve prostate pain. In addition to cost, antibiotics burden patients with risk. Antibiotics can cause allergic reactions and potentially fatal forms of hypersensitivity such as toxic epidermal necrolysis (Stevens Johnson syndrome; most commonly after sulfa antibiotics, such as Bactrim). They can cause loss of normal intestinal bacterial flora, which can be hard on the stomach and intestines, which can lead to nausea and diarrhea. Other potential risks include loss of balance (ototoxicity), kidney damage (nephrotoxicity), tendonitis, and tendon rupture. In a recently published study in mice, it was discovered that antibiotics may actually increase the risk of recurrent bacterial infection, which implies that perhaps antibiotics can transform acute illness into recurrent and/or chronic illness. The specific relevance to humans is not known, but this is one more note of caution remind us that we have every reason to optimize the targeting, dosing, and administration of antibiotics. The effective application of antibiotics for prostatitis depends upon infection with bacteria being the cause of the symptoms and their being sensitive to the selected antibiotic. These requirements are most convincingly met in the case of type I acute bacterial prostatitis. This kind of prostatitis is characterized by combinations of such signs and symptoms as pain, burning on urination, urinary frequency, malaise, chills, fever, and prostatic tenderness. Laboratory testing shows bacteria and white blood cells in the urine. Type I prostatitis is generally sensitive to antibiotic treatment and resolves quickly. 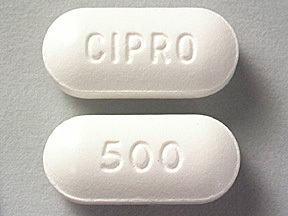 Among the effective antibiotics are fluoriquinolones, such as ciprofloxacin, third-generation cephalosporins, and aminoglycosides; these may be administered by the oral anr/or intravenous route. This less intense but more durable form of bacterial prostatitis is generally caused by Gram-negative bacteria, with which the prostate may normally be colonized. Even though relapse and/or reinfection may occur, antibiotics may provide relief from episodic symptomatic episodes that may be associated with bacteria and/or white blood cells in the urine after prostate massage. Among the best choices here are the fluoroquinolones and macrolides class, and the greatest experience appears to be with ciprofloxacin, to which an estimated 60-80% of E coli and Enterobacter seem to respond well. By contrast, type II prostatitis caused by Pseudomonas species is hard to treat. For type II prostatitis, antibiotic treatment should be sustained for at least 4-6 weeks. As its historic name implies, type III prostatitis is non-bacterial. In principle, then, there would be no room for antibiotics in its management. Evidence notwithstanding, the fact is that antibiotics are routinely prescribed for patients with type III prostatitis. In a study of patients treated in facilities ran by the Veterans Health Administration, researchers found that prescriptions for fluoroquinolones were filled in 49% of the patients with chronic pelvic pain syndrome, compared with 5% of men without this condition; other antibiotics were also prescribed in increased frequency. The increased use of antibiotics was independent of age, race, and other illnesses. In other words, this study documents the general perception that men with type III prostatitis are over-treated with antibiotics. There was no difference in the degree of decrease across treatment arms: Antibiotics made no difference. If you have prostatitis, talk with us about the use of antibiotics. It may be that they are a good idea. But not necessarily and for all the reasons cited above, their use should be targeted with full knowledge of potential risks and benefits. Content copyright . The Krongrad Institute, Aventura, Florida, USA. All rights reserved.